As someone who is constantly multitasking and has a very analytical and active mind, getting zen and mediating was very appealing. But mediation wasn’t easy. In a group setting I was conscious of those around me. At home I could hear my phone’s notifications go off or my back would start to ache. And there was always the temptation to take a peak at the time. When I heard that Float Valley was opening in my hometown of Markham, Ontario I was excited to try it out. Floating is a term for using a sensory deprivation tank – a lightless, soundproof tank, with skin temperature water and a high concentration of Epsom Salt ( 800 pounds of magnesium-rich Epsom salts!). Once in, it’s the closest you can get to feeling weightlessness. You loose track of where your body ends and the water begins. It’s as close as you can get here on Earth to feeling like you are floating; it’s like your brain and thought process are in a limitless black space. And it can be amazing for your mediation practice. Floating filters out so many of the distractions and gives you a gentle introduction to the zen mediation mindset. It’s like mediation on training-wheels! You just need to show up and breathe. Treating yourself to multi-pack or membership makes floating a more than a novelty, it can become the basis for a ‘mediation practice’, a more focused mindset, and building the bridge between your subconscious and conscious. As you do more sessions you get better at letting go, going deeper, and learning more about yourself. Here are tips for before, during, and after your float to get the most out of it. Set your attention: My first few floats were just about getting use to things. After a few times, I would set the attention for my float. Are you looking to deeply relax? Gain creatively? Work through an issue or problem? It may be a good idea to pick some calming affirmations you can use in the the tank ahead of time. Start to wind down: Just like spas ask you to come 30 to 15 minutes before your float, you should do the same before you float. Float valley has meditation room and another room with a cozy fireplace and adult coloring books. You’ve just battled traffic, and rushed over to your appointment, so take five minutes and wind down! I often use the Insight app on my phone and do a short meditation to connect with my breath and relax. Take a shot of Kava: Kava is a root plant found in the South Pacific islands. It has a calming effect, producing brain wave changes that are said to relieve anxiety, restlessness and stress related symptoms. After you have floated for a few times, try a shot of this before you float to take it to the next level. Aquatic savasana: During your first float you may find yourself moving around a bit and trying out different poses, like your hands above your head or on your tummy. Try a Savasana or Corpse Pose, which in Yoga is often a favorite blissful ending to a yoga practice. Think of your float as an hour long savasana! Have your palms up and breath deep and release all your stress. Breathing awareness: Bringing you attention to your breath is an amazing place to start. It’s central in meditation, it’s used in yoga, and essential for activities of endurance like long-distance running. It can be a game changer! Your breath is a very simple and great place to start. Breathe in as deep as possible through your nose, pause for a few seconds, and fully exhale through your mouth. Really focus your awareness on your breathing. This is a great thing to fall back to whenever you want to quite your mind. Just be: Just breathe and float. It's really that simple. Express gratitude: You will come out of the tank with a fresh perspective. As you shower and get dressed - don’t rush! Think of ten things to be thankful for. Reflect: What did you get out of the float? What would you like to do differently next time? It’s a great idea to take some notes or journal it out. Crystal Power: I’m all about that healing crystal power! 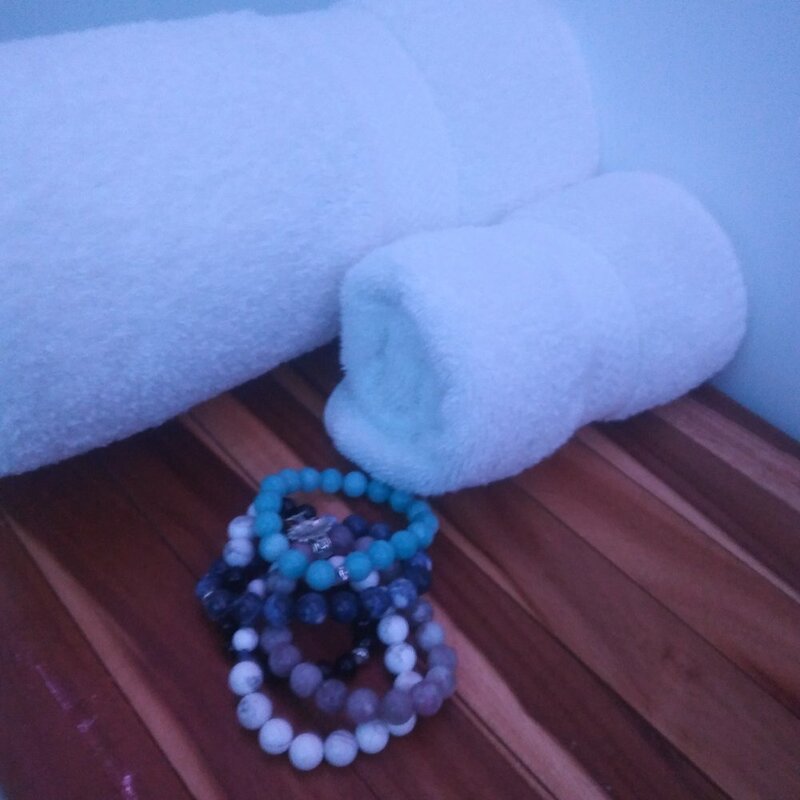 While I don’t recommend wearing gemstone into the tank, having them afterwards can help extend the power of the relaxing effects of the tank. I love wearing calming Howlite or something grounding like Basalt/lava rock where I can put some lavender essential oils on it to diffuse. I hope this helps you get a better idea of what you can expect and how to make the most of your float! Here is the information on the one I go to in Markham, Ontario: Float Valley, 5261 Hwy 7 Unit C102, Markham, ON L3P 1B8 New customers can enter code yi-599920 in the Promotional Code box on the online booking page and will automatically get $10.00 off their Float. Have you tried floating? Have any questions? I would love to hear from you in the comments!